Although the Battle of Belvedere took place about 8 km from Monte Cassino, we think it would be useful to describe the events at this symbolic site, whose name is used to refer to all the fighting that took place in the area around Cassino from January to May 1944. 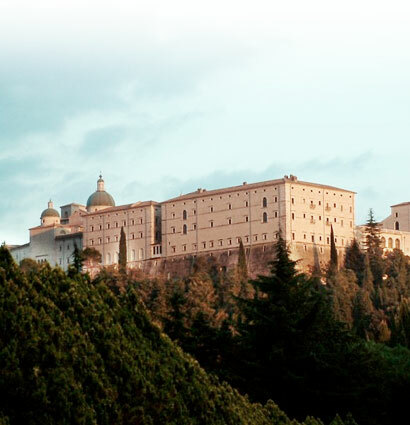 The monastery of Monte Cassino is located at the summit of the mountain of the same name. Founded in 529 by Saint Benedict of Nursia, it is considered to be the cradle of the Benedictine order and its role in the history of Christianity is of immense importance. The monastery contained cultural treasures of inestimable value including a library containing illuminated Byzantine books over a thousand years old. While the attitude of the Germans towards the monastery was irreproachable, unfortunately this was not true of the Allies. Initially, the Germans had good relations with the monks, particularly with the Abbott, Monsignor Diamare. In October 1943, the Germans, aware of the damage that the war might cause to the treasures of the monastery, had them evacuated with their characteristic organisation and attention to detail. Each item was inventoried, listed and packed with care. Colonel Schlegel, who was open-minded and respectful of art, supervised the operations. General von Senger und Etterlin was personally involved in sending the convoy to the Vatican and the Germans cannot be accused of having misappropriated these riches for their own gain. In February 1944, the New Zealand General Freyberg insisted on destroying the monastery, although the Allies had no information that it was occupied by the Germans. Clark and Juin tried in vain to oppose this decision for ethical and strategic reasons, given the lack of reliable information. The facts proved that Clark, who complied with the order given by General Alexander, was right. Clark was convinced that this decision taken by Freyberg and Alexander was a major mistake. Freyberg, who made numerous strategic errors in the Italian campaign, forced this brutal and basic operation on his colleagues and the monastery was bombed continuously for three whole days. The Allies had no appeal against the result: the bombing of Monte Cassino was not only an outrage against an incomparable monument of Christian civilisation, it was also a strategic error which had the opposite effect to that expected by Freyberg and Alexander. Indeed, not only was the monastery empty of all weapons or Germans at the time of the bombing, it did not constitute a German occupied fortress in any way. On the contrary, once the monastery was in ruins after the continuous bombing, the Germans were able to occupy them. The bombing had the opposite effect to that expected. As a result, we were able to quietly occupy the monastery, especially as ruins provide a better defence than buildings. In wartime, buildings you want to defend have to be knocked down. Thanks to the bombing, the Germans obtained a dominant strongpoint, which proved to be very valuable in all subsequent fighting. Clark’s vision and far-sightedness should be stressed. I was one of the chiefs and I was in charge of the operations at Cassino. I said at the time that there was nothing to prove that the enemy was using the monastery for military ends. Now I maintain, and we have certain proof, that no German soldier, except for emissaries, ever went inside the monastery other than to care for the sick or visit them. […] The bombing of the monastery was not only a psychological mistake that was harmful for our propaganda, but also one of the most serious tactical errors. Quite simply it made our task more difficult, more costly in men and equipment and it caused us to lose time. Juin confirmed in “La Campagne d’Italie” that this was indeed Clark’s position. It is clear that the two men renewed their links when this question, which had so much symbolic value, arose. The monastery of Monte Cassino was totally rebuilt after the war.